Waking Up From Surgery: Cold, Confused And Aching For Loved Ones : The Baby Project When Andrea Pike woke up from surgery from her C-section, she had no idea why so many people were there to see her. And then the story slowly came out. When Andrea woke up from surgery, she was cold and confused, and she immediately asked for her husband, Jeff. Yesterday, we posted the first part of Andrea Pike's birth story. 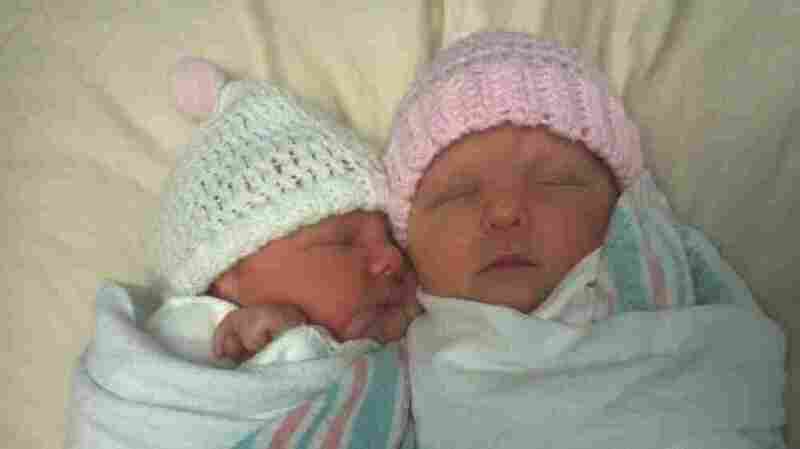 She gave birth to her first twin, but the second was transverse, so she had to have a C-section. That's when things got scary. Andrea blacked out. Her husband, Jeff, wrote the second part, about how he witnessed the birth of his second daughter. Then, he wrote, there was a flurry in the operating room — surgeons came in and he was pushed out. As he waited, a nurse said to him, "I'm so sorry. They're doing everything they can." Here, Andrea writes part three, which begins when she wakes up. I'm cold. No, I'm freezing. I'm shaking so hard, and I'm afraid my teeth are going to chip from rattling together as hard as they are. I'm not sure where I am. Wait, no ... I'm in a hospital. Right? There's a person sitting next to me, and she smiles at me when I look at her. She says something to someone outside of the small, curtained-off corner we're in. I'm still freezing, and now I'm starting to panic. I don't see the one person I need. The one person who can comfort me and tell me what is going on. "Where is my Jeffrey?" I whisper through chattering teeth. "We're getting him, sweetie," says the lady sitting next to me. I close my eyes, and I fall back to sleep for what feels like hours. When I open my eyes, I see him. I want to cry, but for some reason, I don't. "Jeffrey, I love you so much," I tell him. He comes closer to me and nuzzles his face to mine. His hands and cheeks and lips are so warm. Then, like a flash flood, it all comes back to me. I had a baby. I had two babies. I got to push one out. The other one had to be cut out of me. Where are they? Are they OK? Are they healthy? Jeff says something to me, but I don't hear him. Maybe I hear him, but I don't understand him. He steps back a little and motions to the clear, plastic tub beside my bed. And there they are. My babies. I know them both, but the one on the left looks more familiar to me. Jeff picks up the one on the right and brings her face to mine. She's beautiful. I'm already so very in love. I think he's telling me that our family is here and that they want to see me. I see my mother-in-law appear from behind the curtain. Her hair color is different from the last time I saw her. She's saying something to me, and it looks like she's been crying, but I don't know what she's saying and I have no idea why she would be crying. She disappears, and then my sister-in-law appears. She's wearing a ball cap, and her curly hair looks cute in a ponytail. She says something too, but I'm not sure what. Then she leaves and Barb, my best friend, shows up. It's starting to feel a bit like a magic show; people appearing and then disappearing into thin air. She says that my hands look really swollen and asks if my wedding band is hurting my finger. I don't remember answering her, but she says that it looks like it hurts. And just like that, she's gone and is replaced by my father-in-law. He's smiling and looks really, really happy. At one point, I'm on a cell phone, talking to my dad. He sounds shaken, but happy to be talking to me. I still want to know what happened to me. I can see the clock from where I'm laying, and it's almost six hours from the time I remember going into the operating room. That doesn't seem right. Jeff tells me that they're going to start bringing us back to our room and that they're going to take Natalie first, so they can give her a bath. He kisses me and leaves. Elizabeth (left) and Natalie sleep together a few hours after they were born. The lady who has been sitting next to me this whole time turns out to be a nurse. She looks at me and says, "You know, that man loves you so much. Even though he wasn't in the room physically, he never left your side." I nod and begin to cry. I ask her if I can hold Elizabeth until we go back to our room. I want to hold her because I know she was born early, and I remember hearing about skin-to-skin being rather healing for preemies. I want to try to heal her prematurity. I lower my gown and she is placed, wearing nothing but a diaper, on my chest. The instant her skin touches mine, however, I feel that she is healing me. As we lie there, meeting face-to-face for the first time (skin-to-skin, rather), my body begins to warm, my jaw stops vibrating, and I let myself melt into my precious daughter, and I weep. The next morning, when I'm finally conscious enough to hold a conversation, I ask my nurse to tell me exactly what had happened. She sits down, and as my daughters sleep in their tubs and my husband sleeps on the fold-out bed in the corner, she tells me the story from the night before. I hear everything she says and understand what it all means, but it all sounds made-up and over-the-top. It wouldn't be until weeks later, as I sat home alone with my girls while my guys went to the county fair, that I would really grasp what had happened. I was getting ready to take a shower, and I happened to catch a glimpse of the stapled incision across my lower midsection. I touched it and said out loud, "I don't have a uterus anymore." As soon as those words left my lips, I sobbed. 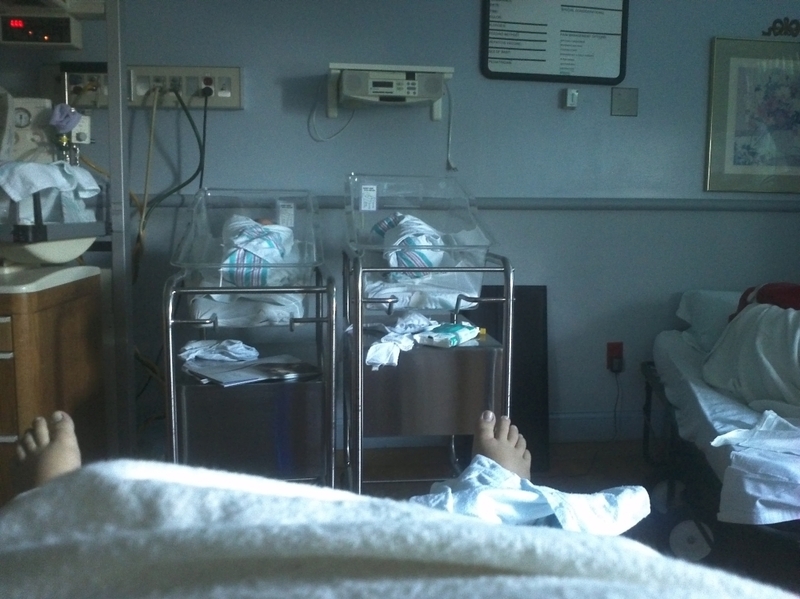 Later that night, Jeff and I talked about the girls' delivery and subsequent surgery. "The way I see it is this: Your uterus was sick to begin with, but it managed to give us everything it had," he said. "You're right," I said. "She gave us our daughters as a swan song, and then she died. Sort of poetic, if you think about it like that." As I drifted off to sleep that night, being held tight by my Jeffrey, I realized that I was one of the lucky ones who not only had everything she wanted in life, but was fully aware of it.